Compounding staff shortages are outdated sensors unable to distinguish between humans, vehicles and animals. They can't tell cows from criminals or wild boars from dirty bombers. The circumstances of U.S. Border Patrol agent Rogelio Martinez's death this week remain murkier than the Rio Grande River. Agent Martinez succumbed to critical head injuries early Sunday morning. An unnamed partner, who came to Martinez's aid after he radioed for help from a remote area of the Big Bend sector in Texas, also suffered serious wounds. Whether by deliberate ambush or accident, one of our border enforcers is dead and the other hospitalized. This much is clear: Dumb sensors + depleted forces = deadly border disorder. Agent Martinez had ventured out alone to check on a ground sensor to determine who or what had set it off. He confirmed to his colleagues that human activity had activated the alarm before he died. Here's the scandal: Our federal government has been squandering billions of dollars on inferior border technology for years. It's a monumental waste of taxpayer funds and a dangerous redistribution of wealth to crony contractors, whose ineffective pet projects are putting our men and women on the front lines at risk. Nearly 14,000 ground sensors have been littered along the southern border over the past several decades—some dating back to the Vietnam War era. Untold numbers have simply been buried and lost by federal workers who failed to record where they put them. Twelve years ago, a Department of Homeland Security inspector general's report found that agents couldn't determine the cause of 62 percent of the sensor alerts because they were "unable to respond to the dispatch, or it took the agent too long to get to the sensor location." Compounding staff shortages are outdated sensors unable to distinguish between humans, vehicles and animals. They can't tell cows from criminals or wild boars from dirty bombers. Thirty-four percent of alerts were confirmed false alarms in the 2005 review. Only 2 percent resulted in apprehensions of immigrants in this country illegally, the feds admitted. 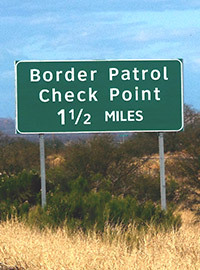 The Arizona Republic reported that "a possible false alarm from a ground sensor, and faulty radio communications, may have contributed to the death of Border Patrol Agent Nicholas Ivie in a friendly-fire incident" in 2012. "(A)gents didn't detect anyone but each other when they arrived. Ivie, responding separately, apparently mistook the other agents for smugglers and opened fire. One of the agents shot and killed him." A $1 billion integrated fixed tower project, fronted by Boeing, was supposed to remedy the flaws of the ground sensor system. A surveillance program along the southwest border in Arizona, the IFT systems "are fixed surveillance assets that provide long-range persistent surveillance" using radars that send pictures back to a central hub to monitor illegal crossings and criminal activity. But the Department of Homeland Security's inspector general reported this summer that the towers had never been properly tested for suitability and operational effectiveness. Its successors haven't fared much better. On a trip to the Sierra Vista, Arizona, region earlier this summer for my CRTV.com show, "Michelle Malkin Investigates," I talked to ranchers who pointed out fancy new towers with fatal blind spots, out of reach of deep washes and heavy forests where illegal immigrants and drug smugglers travel. "We have $50 million of infrastructure on this ranch now," fourth-generation Arizona rancher John Ladd told me during a tour of his property, "and none of it has worked. Camera towers, radar, fence, roads, street lights." All the technology in the world is useless, he has long pointed out to politicians and bureaucrats, without boots on the ground. And Border Patrol agents parked in air-conditioned cubicles hours from the border don't count. "You got 600 (agents) in Tucson" who "take 6 hours to get to the border. Move them down! You got Nogales ... and Naco and Douglas that are within a mile of the border," Ladd points out. "All the rest of them are more than 50 miles north. Why do we have that? What good is that?" Longtime illegal immigration activist and systems engineer Glenn Spencer, who I first met in California in the 1990s, has lived and worked on the Arizona border for more than decade. He patented and tested a pilot system of seismic detection and ranging on 1.5 miles of his friend John Ladd's property called Seidarm and paired it with a drone, dubbed Hermes, which automatically launches when border activity is detected within 500 feet of the smart sensors. It can be manufactured and built at a fraction of the cost of the big defense contractors' systems. Unlike much of the government's gold-plated technology, Ladd said: "It worked." "If they had SEIDARM/HERMES installed, they could have checked out the ground sensor without putting the agent in jeopardy," Spencer told me after Agent Martinez's death hit the news this week. "They don't want to measure it; they don't want to secure the border; they want to make it LOOK like they are." Beltway business as usual. Another agent's life sacrificed. President Trump, the clock is ticking. Michelle Malkin is host of "Michelle Malkin Investigates" on CRTV.com. » How Bad Does Border Have To Be For Democrats To Admit It's An Emergency? » Can Moderate Dems Talk Pelosi Out Of Extreme Border Position?